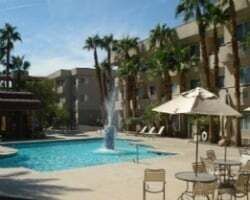 *Fortune Hotel and Suites* is ideally located just blocks from the famous Las Vegas strip and minutes from Las Vegas International Airport - McCarran Airport and popular tourist attractions. Guests can catch up with work at the desk and make use of complementary internet access to stay connected with family and business. Unwind on a king- or queen-sized bed after a day's business or sightseeing. Wake up to a complimentary breakfast and enjoy the pool and hot tub or take the shuttle to the airport or strip. Inquire today for dates available at this beautiful resort not far from the Vegas strip!